Home » Uncategorized » Why do BAD things happen to GOOD churches? I have been in pastoral ministry for 21 years. And I’ve served my current congregation as Lead Pastor for the past 12 months. And I am constantly asking questions about why certain unexpected things happen in the church. Have you ever had a family that you thought was completely ‘bought in’ suddenly leave the church? Have you had someone you thought was fully supportive get angry or frustrated with you in leadership? Have you had a marriage in the church that seemed to be solid fall apart due to an affair or financial troubles? Have you had staff that couldn’t get along, leaders whose theology became unhealthy or people whose attitude went to H-E-Double Hockey Sticks (Its a PG rated blog… lol) in a heartbeat? And for years things like this caught me by surprise. But today, as a leader with a few seasons of ministry under my belt and a few grey hairs under my hat, I recognize that these things are inevitable. 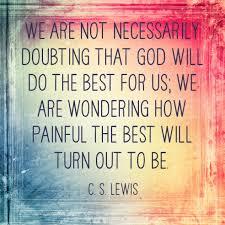 If God is going to take us from where we are… to where He desires us to be… we have to be willing to endure hardship. Aside from saying that it is ‘part of maturing,’ I really can’t say exactly WHY bad things happen to good churches. But I have a few thoughts on the subject. 1. Never forget that we have an enemy. Satan prowls around desiring to defeat the church. He lies. He cheats. And he tries to make us believe things about ourselves, about one another and about God that are not true. Because of that, rumors, gossip, misunderstanding, bad communication, anxiety and insecurity are all playgrounds upon which he enjoys games of war. Satan is the enemy of the church. 2. Never forget that we are a combination of spirit and flesh. Our flesh wars against the voice of God in us. This personified inner struggle within each believer means that someone may make great decisions today and horrible ones tomorrow. There is never a time when the Christian is promised practical victory over the flesh. At least not until our eternal salvation takes place with Christ in heaven. Until then, we are each in a battle for our own soul. Christ has won that battle, but we are still fighting the war with ourselves. A church full of people at war with themselves is a church with unpredictable daily realities. 18And I know that nothing good lives in me, that is, in my sinful nature. I want to do what is right, but I can’t. 19I want to do what is good, but I don’t. I don’t want to do what is wrong, but I do it anyway. 20But if I do what I don’t want to do, I am not really the one doing wrong; it is sin living in me that does it. 21I have discovered this principle of life—that when I want to do what is right, I inevitably do what is wrong. 22I love God’s law with all my heart. 23But there is another power within me that is at war with my mind. This power makes me a slave to the sin that is still within me. 24Oh, what a miserable person I am! Who will free me from this life that is dominated by sin and death? 25Thank God! The answer is in Jesus Christ our Lord. So you see how it is: In my mind I really want to obey God’s law, but because of my sinful nature I am a slave to sin. 3. God uses TOUGH EXPERIENCES to build TIGHT CHARACTER. Romans 5:3 We can rejoice, too, when we run into problems and trials, for we know that they help us develop endurance.4And endurance develops strength of character, and character strengthens our confident hope of salvation.5And this hope will not lead to disappointment. For we know how dearly God loves us, because he has given us the Holy Spirit to fill our hearts with his love. 4. God uses pain to CORRECT US when we sin. In a Proverbs chapter focused on character development and the way leadership works well, God closes out the writing with this statement. Just as a good parent loves their children enough to discipline them, a good God disciplines his children. When a church suffers a difficult moment, it could be that God is battling their pride, arrogance or desire to take too much of the credit for their success. 2. God uses problems to inspect our motives and inner desires. It is God’s desire to change us. If you don’t like change… you won’t like God. He is regularly making us change for the better. That is part of what it means to ‘belong’ to Christ. We have given Him our lives. And He is making it what He wants it to be… for our own glorious and eternal good. 3. God uses problems to direct our path and help us make decisions. I am confident that I would always choose the easiest path, the past of least resistance and pain. But that path isn’t the most valuable one. And it won’t help me grow. And it usually isn’t the path that God chooses for me… or you. And when we find ourselves unwilling to follow Him down the difficult path, Jesus often uses the problems we face to help us make decisions that lead us down the most profitable path. Take Jonah and the whale for instance. God tells Jonah to preach truth to Ninevah. Jonah says no and heads in the opposite direction. God sends a whale to engulf him. In the belly of the whale, Jonah becomes more… well lets just say OPEN to God’s direction. Jonah goes to Ninevah. Ninevah is saved. God is glorified. Good story. Here are a few reasons why bad things happen to good churches. To get to the next level u have to activate ur faith like u haven’t activated it before. Pastor Brad, I found your article completely truthful and insightful. I don’t know you as some of the people at PHBWC or attend highschool or grow up in Livingston. But I deeply respect the man of God you are. You live by example and honestly for what previously occurred in our church prior to your leadership. It speaks volumes. I enjoy what you are doing with the church. I have not been in attendance due to attending church with a family member not of our denomination. I am foremost a follower of Christ. You and I know denomination doesn’t make the person’s ealk any more or less important or the main thing. I will be back so please don’t feel I have left your pastoralship. God bless you! Sunshine that was very encouraging to me. Thank you. I look forward to seeing you again. And as far as denomination is concerned. I too am a Christ follower. I don’t really gain too much identity from any other title or group. I do enjoy being on a team… be it Baptist or some other Biblically healthy group. But that teamwork will never outweigh my commitment to the big ‘C’ Church which is all who are followers of Christ. You are welcome and wanted at the Potters House.